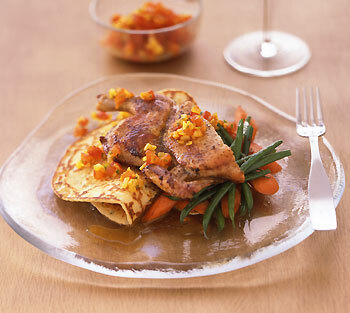 Panfried pressed poussins with accompaniment: fresh tomato and onion chutney, of weights such as 3 cans of tomatoes. Step 1 Cut out backbones from birds with kitchen shears. Pat birds dry, then spread flat, skin sides up, on a cutting board. Step 2 Cut a 1/2-inch slit on each side of each bird in center of triangle of skin between thighs and breasts (near drumstick), then tuck bottom knob of drumstick through each slit. Step 3 Tuck wing tips under breasts. Sprinkle birds on both sides with sea salt and pepper. Step 4 Heat butter in 10-inch cast-iron or heavy nonstick skillet over moderate heat until foam subsides. Add birds, skin sides down, and cover with parchment round and second skillet, then top with weights. Step 5 Cook birds until skin is browned, about 15 minutes. Turn birds over, cover with parchment round, skillet, and weights, then cook until just cooked through, 10 to 15 minutes more. Step 6 Transfer birds to a platter, discarding parchment, and cover loosely with foil. Add stock to skillet and deglaze by boiling over high heat, stirring and scraping up brown bits, until reduced to about 1/2 cup, about 5 minutes. Step 7 Skim fat from surface. Step 8 Halve birds lengthwise and serve each half drizzled with pan juices.